When the Half Mile Track in the Outer Richmond, which had done business under a number of names, faded out of existence sometime in the mid- to late-1880s a vacuum was created. The same need which had brought the track into existence two decades earlier still existed: a facility where "gentlemen" could bring their horses and roadsters to see, to be seen, and to settle the age-old debate of whose team was faster. 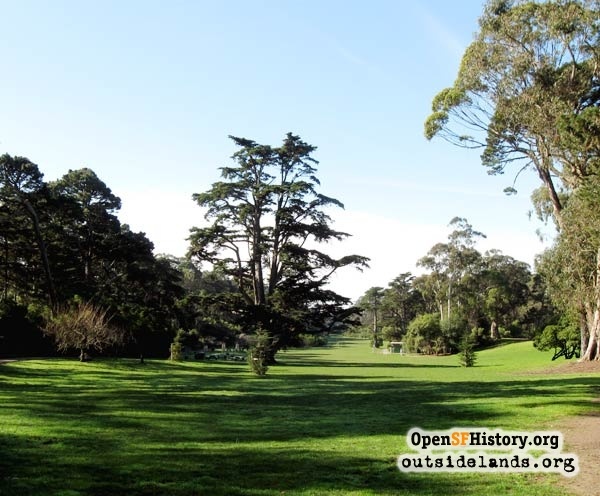 The idea of having a racing facility in Golden Gate Park was almost as old as the park itself. When the Bay District Track was proposed in 1874, the Chronicle noted "the Park Commissioners are also said to regard the project with favor, as it will obviate the necessity of constructing a speed track within the park." 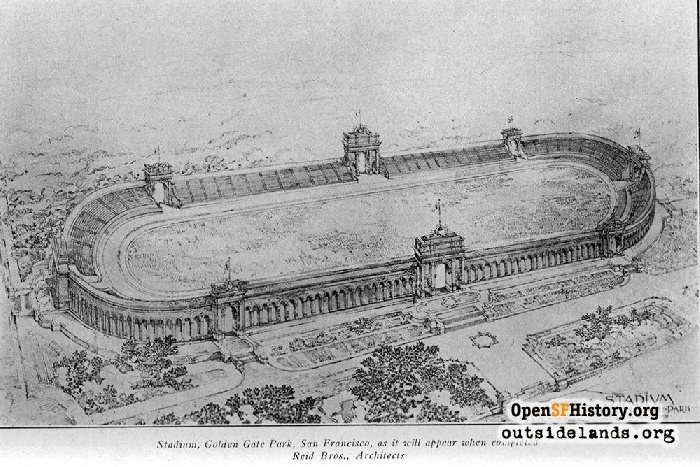 Apparently the need was not totally obviated, for on July 7, 1881, Golden Gate Park Superintendent Francis P. Hennessey exhibited drawings and plans for a half-mile race track and concourse to be built near the southern drive. Nothing came of this plan. A year later Hennessey was dismissed and John J. McEwen, a brother-in-law of Park Commissioner Frank Pixley, was named Superintendent. Commissioner Pixley immediately began to speak of his plans for a great road 150 feet wide for the owners of fast horses. This "driveway" would run in a straight line from the vicinity of the conservatory to the Great Highway. Soon afterwards the Chronicle wrote that the Commissioners were considering a mile-long speed track, 100 feet wide, for the owners and drivers of fast horses. Nothing came of either of these suggestions, but pressure was still being applied to park officials to build a speed track in the park where gentlemen could display themselves and their horses. Despite the gentlemanly demands, the Commissioners held their position that no work would be done until $35,000, the estimated cost of such a track, had been deposited in a bank for the use of the Park Commission. The horse owners were also required to provide two men to maintain the track. These conditions postponed the building of the track for awhile. 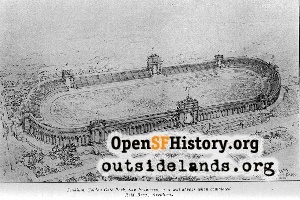 In mid-1887, after the demise of the Half Mile Track, the old idea of a speed track in Golden Gate Park was resurrected and a committee of gentlemen was formed to push the plan. Superintendent William Hammond Hall, not wanting such a thing in his park, suggested two isolated stretches. Since nobody would see the gentlemen, the vain horse owners found Hall's proposals unacceptable. The whole point of the speed road, after all, was to bee seen. Complaining about the rigidly-enforced speed limit in the park---10 miles per hour---the Chronicle harkened back to the nostalgic days of pleasant drives along Point Lobos Road in fancy carriages pulled by lively horses. It editorialized its endorsement for the speed track where the speed limit could be exceeded with impunity, and where men could be men and horses could be horses. Reluctantly, Hall offered four park locations for a speed track. A mile-long route, beginning just west of Strawberry Hill, heading in a southwestwardly direction before curving north to meet the Main Drive near the south end of North Lake of the Chain of Lakes was chosen. By the end of 1887 enough money had been raised and work began on May 21, 1888. Three months later the horsemen attempted to "donate" the road to the park. The Commissioners refused to accept the "gift" until it was completed to the agreed specifications. The gentlemen steadfastly maintained that they had done everything that had been agreed upon and were unwilling to raise more money or do more work on the road. A year after work had commenced on the road, the money raised had given out, the work stopped, and the road stretched straight and incomplete and fast going to ruin. And still unaccepted by the Commissioners. Both the Chronicle and Examiner were advocates for the road and ridiculed the Park Commissioners for not accepting the gift. At a Park Commission meeting on May 29, 1889 the road impasse was discussed. The Commissioners maintained that they were not to blame for the road's poor condition. Since they had never accepted it under the terms agreed upon the year before, they should in no way be considered responsible for it or its deplorable condition. There was nothing they could or would do about it. At its next meeting the Commissioners considered using the labor of the inmates at the House of Correction to complete the road and the grounds in its vicinity. An agreement was reached with the Superintendent of the House of Correction, but labor organizations voiced outraged opposition to this plan and the matter was "laid over." In October 1889, Superintendent Hall reported that the approach of the rainy season made it imperative that the road should be placed in good condition at once. The warning was not heeded and in mid-December a tremendous storm battered the area, severely damaging the still-uncompleted road. Since it had not yet been accepted by the Commissioners, the cost of repairing the damage had to be borne by the horsemen. Sometime afterwards, without ceremony or notice, the Park Commissioners quietly accepted the white elephant that they had for so long tried to ignore. For the next decade it was the Park Commission's headache to maintain, control and regulate a facility restricted for the use of only a few privileged people. But that restriction did not prevent others from attempting to use it. Bicyclists were drawn to it in such numbers that a separate bicycle path had to be constructed for the use of cyclists who wished to propel their cycles at breakneck speeds. By 1901 a familiar refrain was being sung before the Park Commissioners by the horse set: the speed road was in abominable shape and they, i.e. the Park Commissioners, needed to do something about it. The horsemen complained that bicyclists and automobilists received preferential treatment regarding the maintenance of road surfaces for their vehicles, while they were ignored. They moaned that a drive over the speedway in its present condition was a dangerous undertaking and at every moment the life of a driver or a valuable steed was at stake. In 1903 the Call reported "PARK SPEEDWAY GONE TO RUIN." The report contained nothing new, and, in fact, was a rehash of complaints of the "gentlemen" who had been whining for the past 15 years. As the Speed Road deteriorated, a chain of events hastened its demise and bought about a new and grander facility not only for the horsemen, but for all San Franciscans. The first event occurred on November 12, 1898 when a polo match contested on the field of Big Rec attracted a large audience. 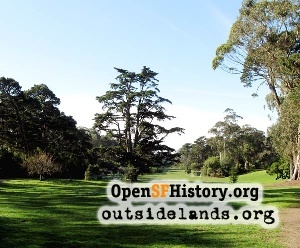 The next link in the chain of events occurred on January 27, 1900, when polo players from Burlingame sought to enlist the financial aid and interest of "men of means in San Francisco, who will lease and fence in suitable grounds...in order to popularize polo among the best people of San Francisco." The final link occurred on June 19, 1903, two months before the Call publicized the deplorable condition of the speed road, when a petition signed by 1,000 young men interested in athletic exercises was presented to the Park Commission asking that an athletic field be built in the park. Commissioner Lloyd favored abolishing the problem-plagued speed road and adding enough land to construct a half-mile circular track with an athletic field in the center where lacrosse, cricket, and other field games could be played. When John McLaren staked out 35 acres of land south of Spreckles Lake for the new track, which would overlap a portion of the old speed road, he found that a mile circumference track could be built rather than the originally conceived half-mile track. A 60-foot wide trotting track would circle the field. Inside the trotting track, and six feet below, would be the athletic field. At their February 5, 1904 meeting, the Commissioners calculated that the new facility would cost $40,000. By March the ball was definitely rolling and many groups wanted to jump on the rolling bandwagon. Superintendent McLaren's revised estimate was that $50,000 would be needed for the project. The Commissioners agreed to provide $25,000 if the interested associations would provide the other half. The Commissioners then ordered that the circular speed track be built, but that no more than $25,000 be spent on it. The remaining work would be deferred until the outstanding $25,000 was secured. Well aware of the fiasco that resulted with the speed road when publicly-raised money was involved, both sides insisted on assurances that work would be done and money would be supplied. On December 16, 1904 members of the Amateur Driving Association appeared before the Park Commission to report that they had $17,800 deposited in the bank and $2,885 additionally promised. On that basis the Commission moved that the amount of public subscription be reduced from the original $25,000 to the $20,000 that the Association could guarantee. On January 6, 1905 a check for $20,000 was presented to the Commission. For this amount of publicly-raised contributions the Commissioners promised a mile track, inside of which would be a bicycle track, cinder athletic track, a polo field and athletic field. The southern side of the new raised track obliterated about 1/3 of a mile of the old Speed Road. One hundred fifty thousand cubic yards of sand was moved and 40,000 cubic yards of fertilizer, clay, and loam was added. The facility did not have an official name, but it was the antithesis of the Speed Road. It was for all of the residents of San Francisco and its access was unrestricted. Work on the facility was interrupted by the 1906 earthquake, but was resumed in May of that year. After the earthquake, the eastern portion of the Speed Road, once the exclusive domain of the privileged horse set, was put to a higher use. In June, the Speed Road became the site of Camp Six, a refugee camp for the elderly displaced by the earthquake and fire. The new facility's first event was held on July 4, 1906 a public celebration of the nation's 130th birthday and a civic affirmation that San Francisco's spirit had not been destroyed by the earthquake six weeks earlier. Twenty-thousand witnessed what was called The Greater San Francisco Athletic Carnival. The next Independence Day 100,000 returned for the event. In-between national birthdays, horse racing, the original raison d'etre for what was being called the "Stadium," was introduced. On May 12, 1907 several thousand people witnessed the first horse races at the new track. During that spring and summer the Park Amateur Driving Association held Saturday light harness races. The contestants were strictly amateur. No professional drivers were permitted. Also prohibited were women drivers and betting. There were no seats for spectators---the grandstand for the stadium being the grassy slopes inside the track. Attendance at the Saturday races was so popular that seating was planned for the southeast corner of the facility, the original finish line. It was originally planned that $5,000 would be allotted each year for the construction of a section of the grandstand that eventually would encircle and enclose the facility. In November, 1907 a judges' stand was donated to the park, which still stands at the northwest turn of the track, the eventual finish line. On April 3, 1909 a 200-foot long concrete grandstand built at the northwest corner of the field was donated by the amateur driving club. For decades harness racing was a regular feature at the Stadium during summer weekends. The opening of the 1915 season brought 5,000 spectators on May 29. Thoroughbreds, on the other hand, never raced on the track. A century after its construction, the horse track of what is now known as the "Polo Fields," is the same as it appeared in 1906. The Speed Road that preceded it is easy to find. When Camp 6 was abandoned in October 1906, the Speed Road became Speedway Meadow. Lacking the vertical and horizontal undulations that characterize all of Golden Gate Park, the former Speed Road, now grassed over, is still visible as an obvious anomaly of the landscape. Situated between two bluffs for most of its eastern length, the unnatural appearance of this meadow cannot be overlooked. At the western end of Speedway Meadow the raised southern berm of the Polo Fields' horse track interrupts the old Speed Road. West of the Polo Field is another meadow, unnamed, that continues westward, straight and level, though greatly narrowed, ending at a parking area alongside Chain of Lakes Drive. This is the western portion of the Speed Road. In the late 19th century, Chain of Lakes Drive did not exist, so the Speed Road continued westward another hundred yards or so, through the Bercut Equitation Field, another post-Speed Road addition, where finally a ridge forces the road to turn right, northward joining Kennedy Drive. Page launched 25 March 2008.